Do you see a large wooden bear holding a welcome sign? 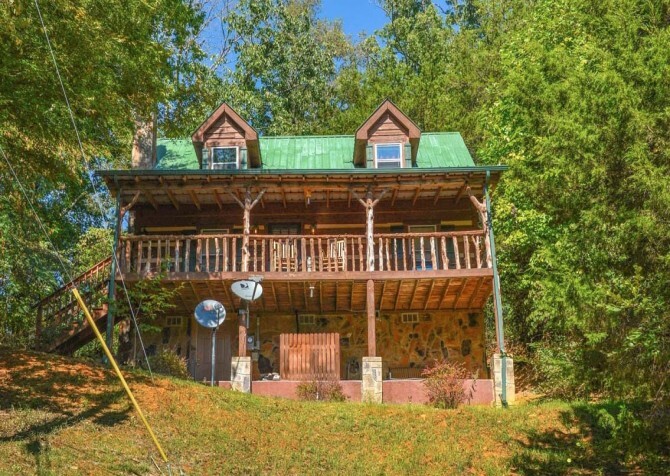 You’ve arrived at Sweet Annie! About 7 miles from downtown Pigeon Forge, this cabin is your secluded Smoky Mountain retreat for single family vacations or small group getaways. 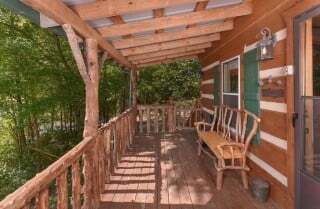 With 2 bedrooms and 2 bathrooms, Sweet Annie will comfortably accommodate up to 8 guests, and together, you’ll enjoy this cabin’s lovely mountain and wooded views. Relax among these views on your rocking chair porch or in your outdoor hot tub. 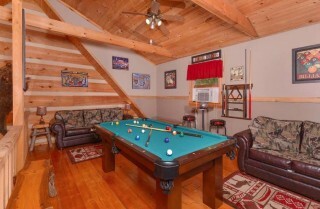 Then plan for some indoor fun with this cabin’s pool table, 60-game arcade, Blu-ray player, and big screen TV. 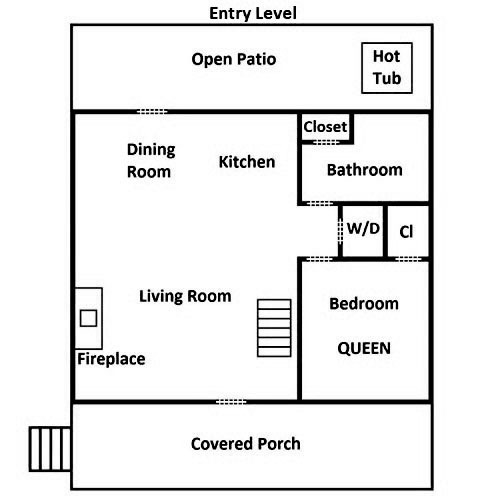 Sweet Annie also provides comforting amenities like a gas fireplace, spacious living room, and cozy bedrooms to make you feel right at home. 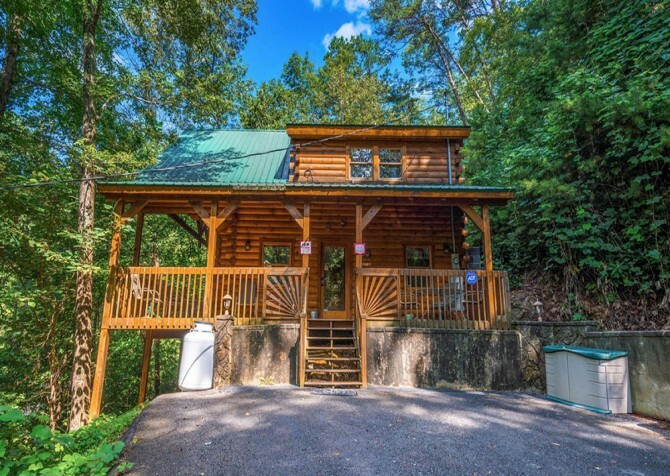 With its secluded atmosphere and convenient driving distance to downtown, you’ll have the best of both worlds at Sweet Annie—plenty of privacy at the cabin and plenty of fun in nearby Pigeon Forge! Book this cabin for your next family vacation, girls’ getaway, or weekend with friends to the Smoky Mountains. 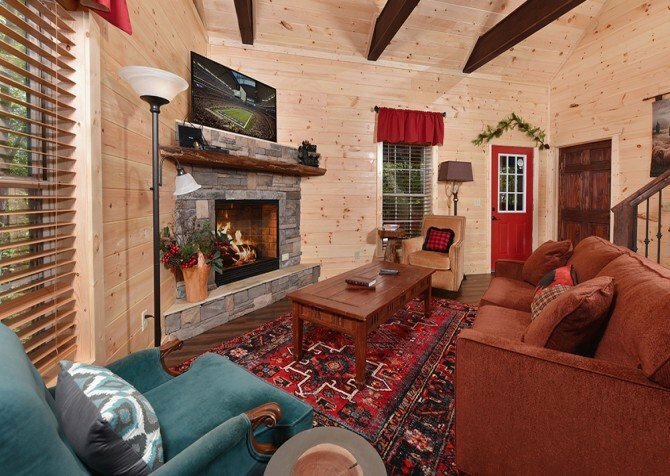 One of the many reasons to book a cabin in the Smokies instead of staying at a hotel is access to cozy hangout spaces like Sweet Annie’s living room. This large room features 2 comfy couches—a full-size couch and a matching loveseat with built-in cup holders and recliners. 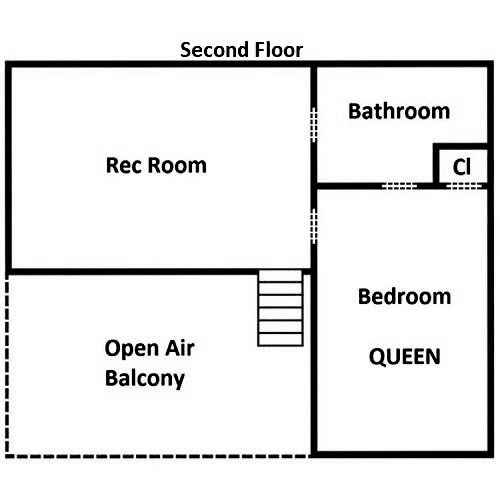 Plan for a family movie night in this space with your 42-inch flatscreen TV, Blu-ray player, and DVD player. Or curl up with a magazine or your iPad, taking advantage of the free high-speed Wi-Fi offered at Sweet Annie. This cabin’s living room is the perfect place to relax after spending a busy afternoon on The Track in Pigeon Forge or shopping at the nearby Tanger Outlets. 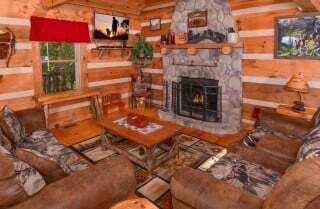 Turn on the gas fireplace, place a variety of your favorite snacks on the coffee table, and enjoy some downtime as a group inside Sweet Annie. 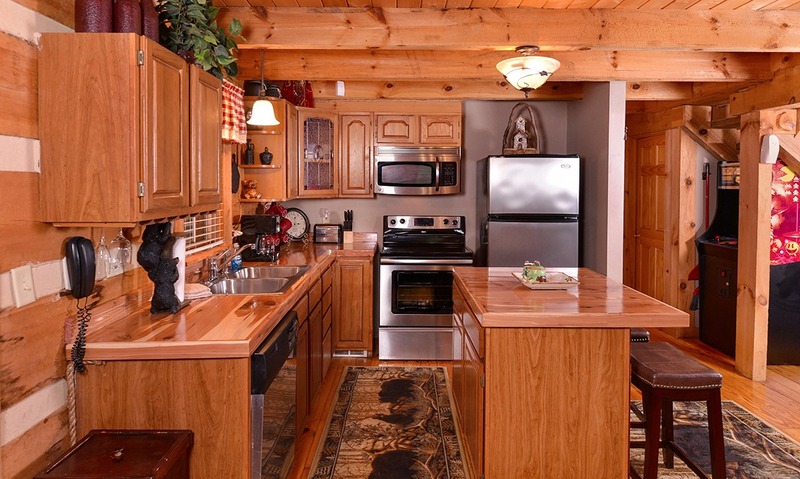 A Pigeon Forge stay just isn’t complete without access to a fully equipped kitchen. Sweet Annie provides just that with its L-shaped kitchen complete with an island. Oak-colored cabinets and green tile countertops complement the wood interior of this cabin. 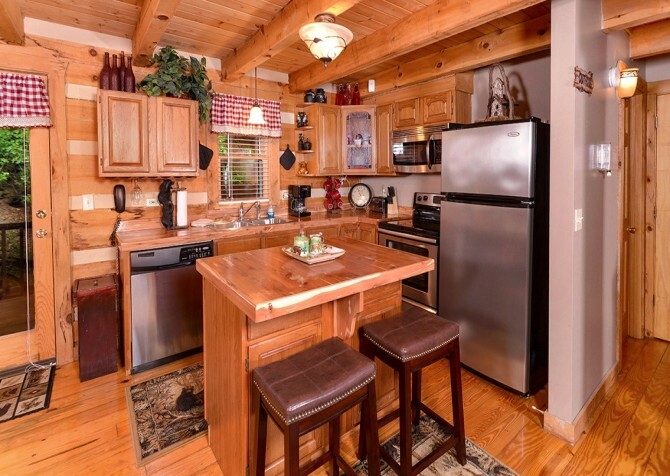 Inside the kitchen, you’ll find black-and-stainless steel appliances, a coffeemaker, and all the essentials when it comes to cookware and utensils. Stop by the grocery store on your way in and plan for family meals inside the cabin. 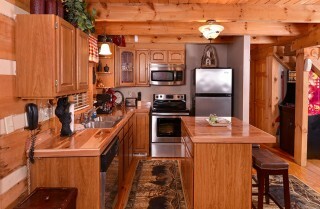 Besides the electric stove and oven, Sweet Annie also provides a charcoal grill for steaks, burgers, or kabobs. 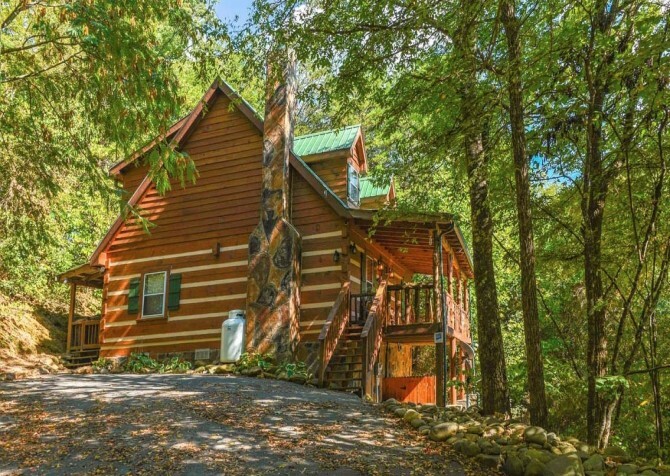 No matter what you fix, cooking at the cabin is a great way to save money and spend quality time as a group while you’re in the Smokies. Looking for a place to sit down for those family meals inside Sweet Annie? 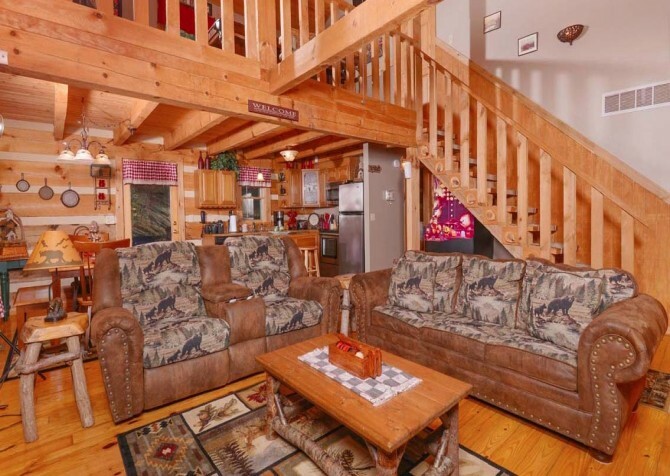 Simply head to your convenient dining room table! This 2-tone wooden table with place settings for 6 might even hold your entire 8-person group if you can squeeze in one more guest at each bench. Enjoy family meals around the table with natural light spilling in from 2 nearby windows. Of course, this space can also function as place for family board games, cards, or crafts with the kids. And even if you don’t feel like cooking, you can always order something to-go from a nearby Pigeon Forge restaurant. 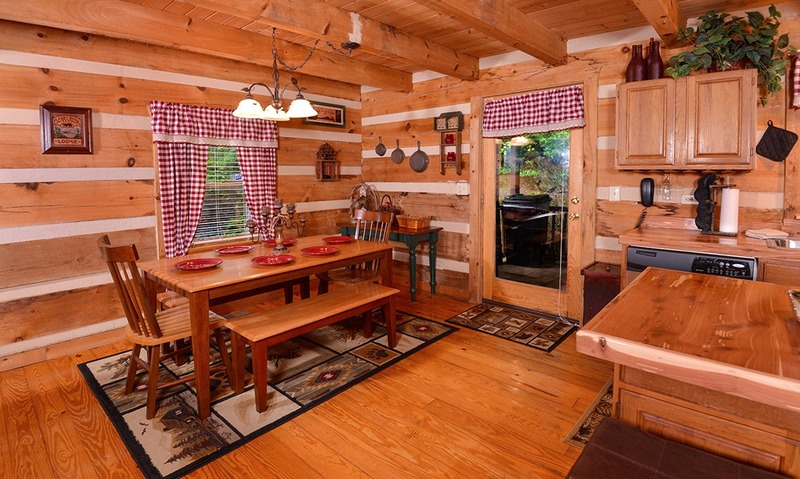 Bring your food back to the cabin for private, comfortable mealtimes with your group during your stay. Although exciting Pigeon Forge attractions like Dollywood and Dollywood’s Splash Country are close to Sweet Annie, you won’t have to leave the driveway to have a great time once you discover this cabin’s rec room! Located in the loft, this rec space features additional comfy couches, a full-size pool table, and a 42-inch flatscreen TV mounted to the wall. You’ll also find a 2-person table for cards, 2 end tables with reading lamps, and a CD player for all your favorite tunes. 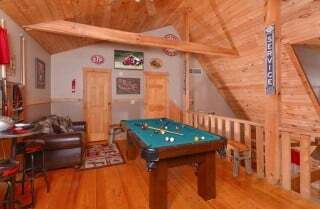 Read a book, take a quick nap, play a board game, or host a pool tournament in the upstairs rec room inside Sweet Annie. 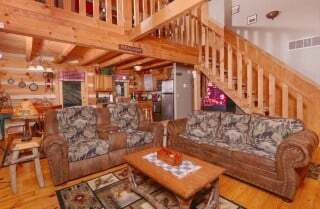 Sweet Annie is built to accommodate up to 8 guests with 2 bedrooms and 2 bathrooms. 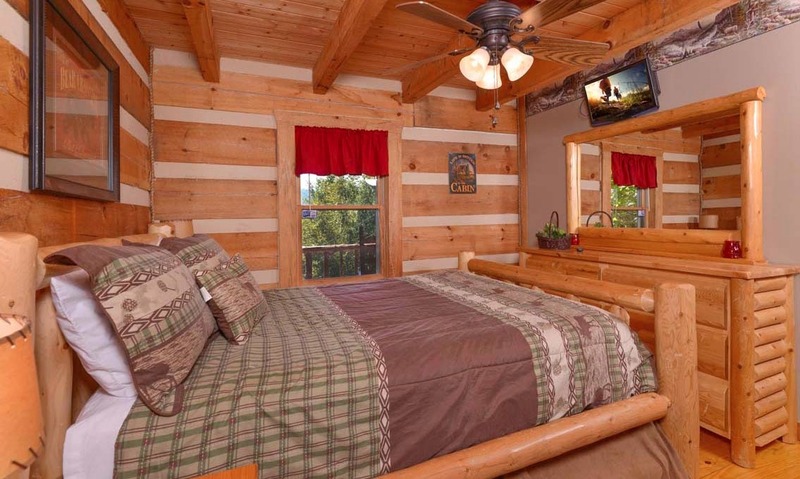 Each bedroom features queen-size beds set on a log-style frame. 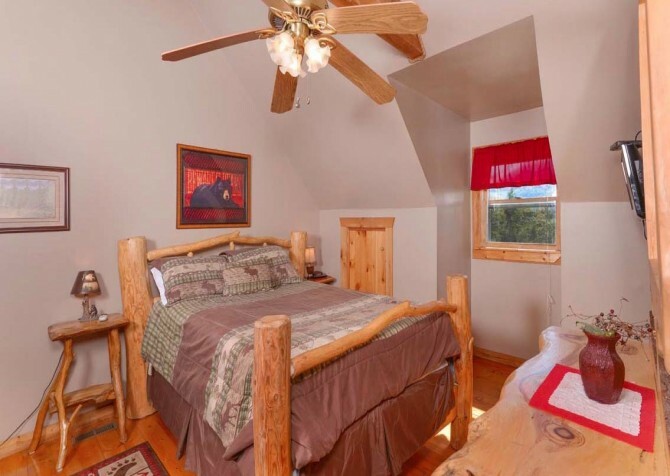 Additional furnishings in each room includes a bureau and mirror, nightstands with reading lamps, and a ceiling fan overhead. 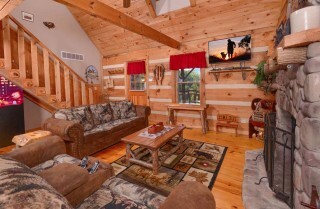 Each room also provides a small window to let in Smoky Mountain sunlight in the mornings and its own TV with a DVD player. 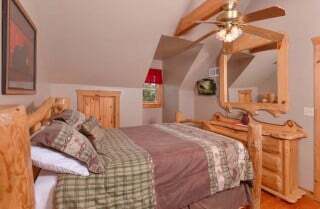 In addition to the queen-size beds in the bedrooms, Sweet Annie provides a queen-size sleeper in the living room and another queen-size sleeper in the loft. Plan to book Sweet Annie for single family vacations and any other small group get-together you might be planning in the Smokies. 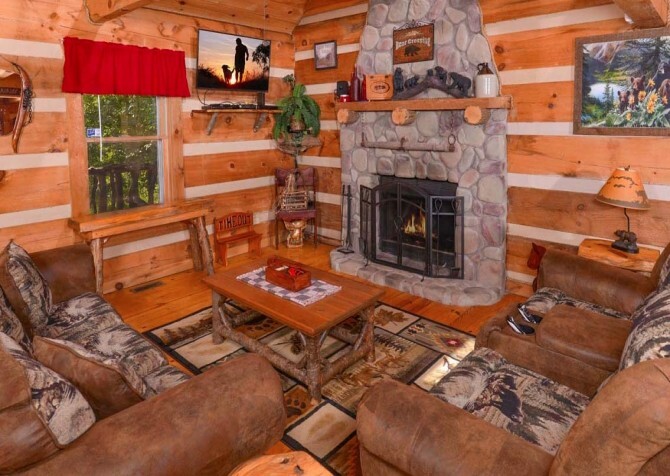 The secluded atmosphere of Sweet Annie is definitely one of this cabin’s best features. You’ll love the privacy of this cabin as you sip your morning coffee on its rocking chair porch or flip burgers on the charcoal grill. 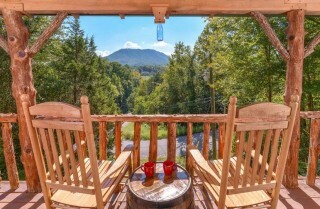 From the porch—complete with patio furniture and whiskey barrel tables—you’ll also enjoy Sweet Annie’s private view of the Smokies. 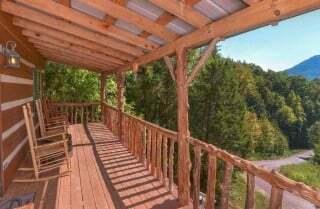 This tree-studded view is one you can enjoy in every season, but you’ll especially enjoy stunning mountain views in the late fall and winter when the leaves have fallen from the trees. Another cabin amenity you’ll find useful in any season is your outdoor hot tub. 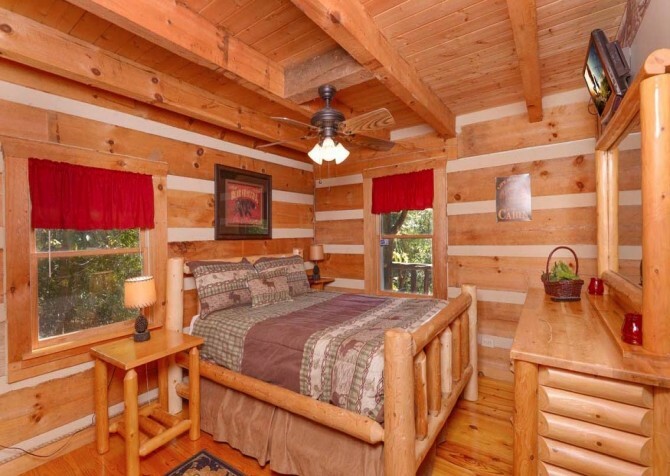 Use this to relax after hiking in the Smokies or to warm up on a chilly fall afternoon. Along with the pool table and big screen TVs inside this cabin, Sweet Annie provides a 60-game arcade right outside the living room. 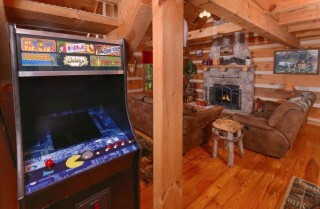 Use all of these amusing amenities for hours of indoor fun on a rainy afternoon or for late-night entertainment. 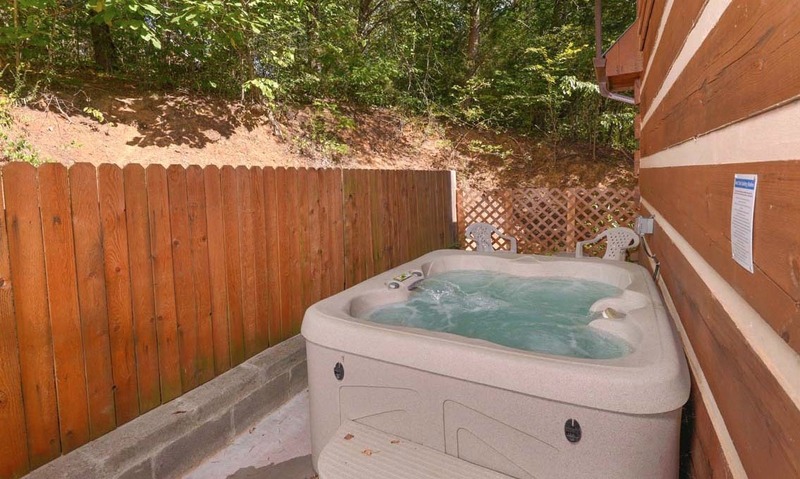 To make your stay even more convenient, Sweet Annie also provides a washer and dryer, which makes laundry a cinch whether you’re washing clothes after a hike or drying your bathing suit after a dip in your outdoor hot tub. Finally, Sweet Annie offers a flat, paved driveway to all its guests. Parking in the Smokies is easy at Sweet Annie! *Internet Restrictions: While Sweet Annie does offer internet, it is not an unlimited plan. Please use for general browsing (like seeing what’s happening downtown during your stay!) and not streaming. Ask your Vacation Planner for more information. 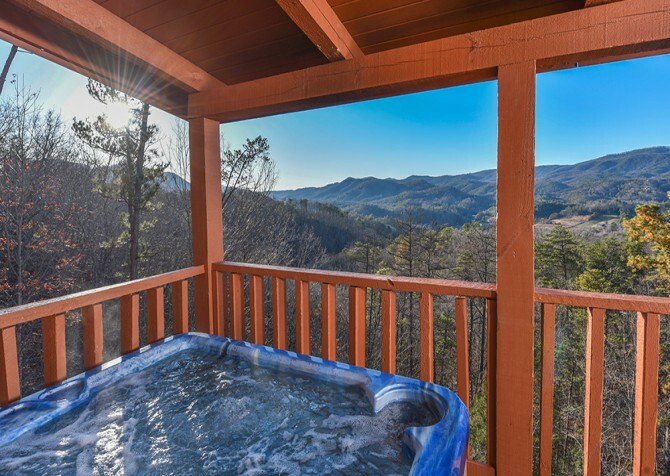 About 7 miles from Pigeon Forge, Sweet Annie provides the privacy you’re craving with convenient access to downtown attractions. If you’re traveling with kids, be sure to check out family-friendly places like WonderWorks and Goats on the Roof. For those traveling with a small group of fun-loving adults, check out ziplining adventures or wet-n-wild attractions like The Outdoor Gravity Park. And for a few Pigeon Forge attractions every age group will love, check out these shows and dinner shows downtown. 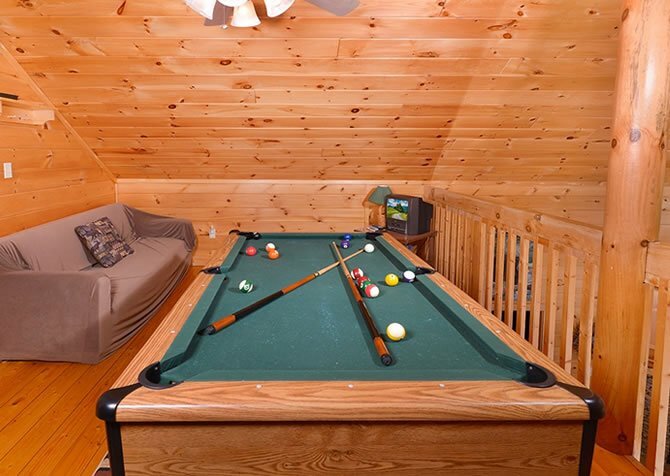 They’ll make a great group date option as well as a family-friendly outing during your stay. Awarded the “Best Live Country Show in America,” the Pigeon Forge show at the Country Tonite Theatre mixes singing, dancing, comedy, American patriotism, and gospel music for a 2-hour show that’s safe for the whole family. Enjoy a feast of biblical proportions and unique, Bible-based productions at the Biblical Times Dinner Theater in Pigeon Forge. Their award-winning live cast performs a variety of Christian music from Southern gospel to contemporary praise in each unique production. Get out your cowboy boots and head to one of Dolly Parton’s famous Pigeon Forge attractions - Dolly Parton's Stampede! Enjoy show horses, thrilling stunts, special effects, and a mouthwatering 4-course feast.